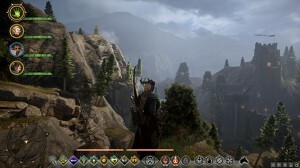 Dragon Age: Inquisition is the third game in the series, and I went into it assuming it would be the last in BioWare’s Dragon Age franchise, but after finishing it last night, I’m not so sure. Really, is any game with a high fantasy setting ever truly over? 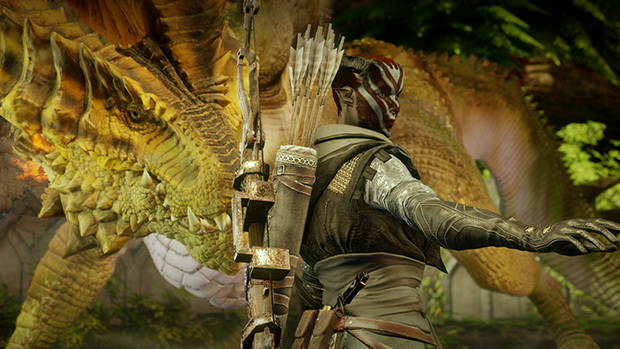 Keep reading below for our full Dragon Age: Inquisition review! The first thing I realized about this game is that it’s big. It is really, really damn big. In fact, it’s probably a completionist’s nightmare because of how monumentally large it is. In my interview with Karin Weekes, she said it was the biggest game BioWare has ever developed, and that shows. 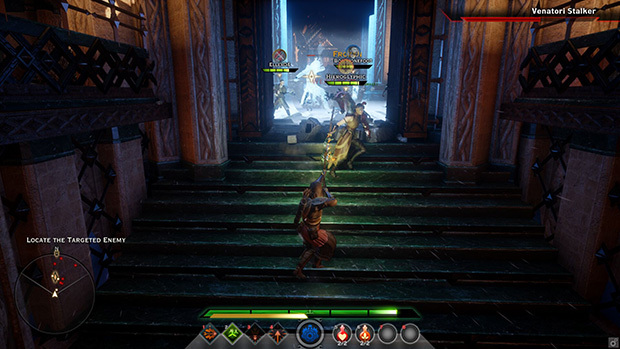 Similar to Dragon Age: II, this game has individual ‘zones’ to run around in, except unlike its predecessor, Dragon Age: Inquisition‘s individual areas aren’t little rooms. The first real explorable area, the Hinterlands, probably has about 20 hours worth of content alone. That’s freakin’ massive. Granted, the Hinterlands is probably one of the biggest areas you’ll explore, but still: it’s easy to get lost in the beauty and size of just that one map. I often found myself saying “Alright, I’m going to finish up all the side quests in this area” only to find myself finding new quests, new landmarks, new resources, and more. I spent well more than 60 hours playing the game, and I know for a fact I only scratched the surface of what’s there. I will say, in some regards, a lot of what I was doing was just filler quests, though. “Place the felandaris on the statue,” one quest told me, and my reward was about 100 gold. Another quest had me deliver a note to a widow, and my reward was a pretty sweet battleaxe. Yet another quest might give you an agent to add to the Inquisition, and it’s hard to tell what quest is actually worth the reward. That being said, I always wanted to complete all the quests assigned to me, and I never felt like it was an incredible chore. Many of them had no bearing on the plot and didn’t give much, but to me that didn’t matter. I was just satisfied ticking that extra objective off my list. Hopping over to the Frostbite 3 engine definitely helped BioWare achieve some impressive graphical fidelity and remarkably beautiful and varied aesthetics. Even in the same map, different regions had very specific aesthetics. Watching the waves roar in the Storm Coast, or the sun shine on the torn and battered battlefields that lead to the lush forests on the Exalted Plains is a testament to not only Frostbite 3’s capabilities, but the skill of world building on the BioWare team. It made me excited each time I entered a new area, because I was never quite sure what I’d find, but I knew it would be impressive. While exploration was absolutely a shining gem in the game, I do have to say the PC controls felt clunky at times. Objects I’d try to interact with wouldn’t quite work unless I was standing in a just-so position, and even then I had to right click multiple times just to get something to work for me. The camera is controlled by holding down the right mouse button as well, meaning sometimes when I wanted to interact with an object, I’d find the camera moving just a little. It also meant that if I wanted to get the best view of the world, I’d have to constantly hold the button down and slowly (very, VERY slowly) move the camera in small adjustments. This was problematic in tight battles, as I never really felt like I was as aware of the battlefield as I could have been. 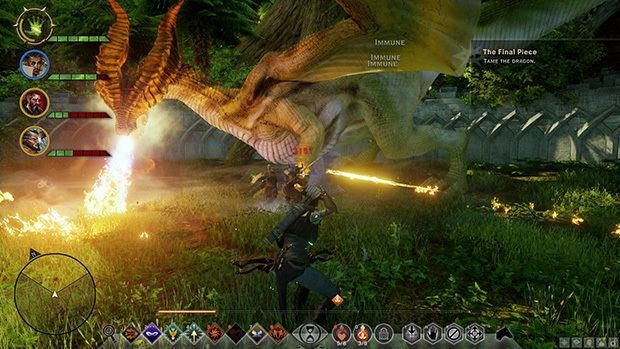 Combat in Dragon Age: Inquisition also has its ups and its downs. While BioWare tried to sell the combat system on the ability to switch back and forth between real time and “Strategic Time,” I found the latter to be inadequate. Giving orders to your followers was not only clunky, but it was also a crap shoot as to whether or not they’d listen. The “hold” command, which should plant a character in a certain position was ignored, as was the “interact with this object” order for certain puzzles. Instead, I just found myself sticking with real time and only issuing orders for things like “drink a damn potion before you die, Iron Bull.” Making matters worse for “Strategic Time” is the fact that the camera really never zooms out nearly as far as I would like it to, so in a large battle it’s super easy to get lost in the battlefield where characters and enemies are spread out. Timing mechanics aside, combat was still incredibly fun when played more like an ARPG instead of a top-down RPG. Micro-managing your own abilities and combos and adjusting your companions’ abilities and behaviors added a good depth, and at least provided some strategy despite the super obnoxious AI. I found combat challenging throughout the game, and if I wasn’t careful even enemies that were several levels below me could take a good chunk of my health. Positioning was always important, as was enemy prioritization. While on the subject of combat, one area that really shined for me was the large-enemy combat. By this I mean fighting giants and dragons. All those battles felt epic and well thought out, especially since attacking individual limbs on the creatures would cause the creature to trip, or react to a critical hit by shaking its foot for paw. Fighting a dragon should never feel easy, and let me tell you it didn’t. There are 10 dragons to conquer in the game as side quests. I found and beat 5 of them, though I keep wanting to go back into all the other areas to find the rest. What also impressed me about the dragon fights was how they fit into the story. They weren’t quests exactly, and the dragons were sometimes a challenge to find (alternatively, they could be super easy to find, but a quick fireball flung at you would let you know you’re probably under-leveled for that), but the way your characters reacted to the sight of them and to beating them was always pleasant and interesting. I especially loved Iron Bull’s gleeful “Let me at ’em, boss!” Back at your base, you’d hear discussion of your conquest among the citizens, or at the war table. It was a nice little touch that showed the changing world and how you impacted it. While on the subject, the story was… interesting. 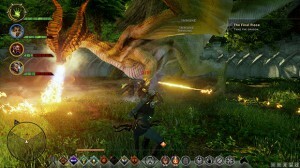 I can’t say it was spectacular, as it left a lot of unanswered questions, and felt like it was setting up even more down the line, so I highly doubt BioWare is done with the Dragon Age franchise. There were definitely high points, like the end of Act 1 that sent shivers down my spine. I enjoyed the voice acting a lot as well, and the characters were wonderfully written. Sera and Iron Bull were hilariously written and voiced, and each of my companions and allies felt like real people. What I found especially interesting was the character banter happening around me while playing, and how that impacted my playthrough. In my save, Dorian and Iron Bull found love (or at least shared a bed), and it was only notable because of how antagonistic their relationship started. That being said, the end to the game was a little unsatisfactory. I would have liked to see more of what happened to the world, but judging by the post-credits scene, that’s something I’m going to find out in either DLC, or a future game. Yes, there is a post-credits scene, and it blew my mind. The rather unsatisfactory end isn’t the only similarity Dragon Age: Inquisition has to Mass Effect 3 (though I should note right here: DA:I‘s ending is definitely the better of the two) is its multiplayer. While Mass Effect 3 was a wave-based map, Dragon Age: Inquisition‘s multiplayer instead is more like a dungeon crawl or a raid from an MMO. You and three other players work together to beat the enemies, explore hidden rooms, find treasure, loot, and gold, and make it to the end of the map. 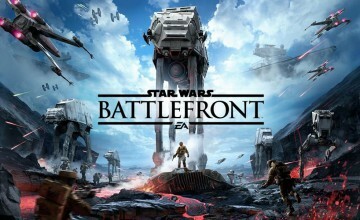 I personally like this system a little better than Mass Effect 3‘s, though the multiplayer isn’t perfect. On the PC, there is no push-to-talk functionality, and since I use a USB microphone, the game couldn’t even recognize it. There is no other way to communicate with your team than through microphone, so often we’d go off in different directions without being able to properly communicate. This is absolutely a glaring issue in an otherwise great game. That also kind of sums up Dragon Age: Inquisition perfectly. It’s an amazing game when it works, but it’s impossible to completely ignore all the bugs or broken functionality, which only makes things more frustrating because you want to keep playing the game for all those amazing moments of fun you experience. 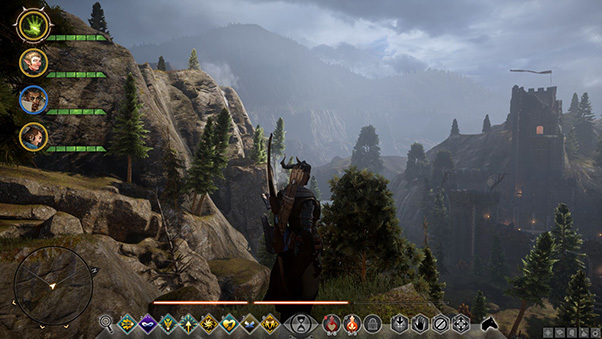 Without the bugs, I’d easily say Dragon Age: Inquisition is one of the best games of the year, but because of the crashes, the bugs, the graphical errors, and more I can’t say that. I’m willing to give the game some slack because I played most of it while streaming, giving me not only poor FPS, but I am sure at least in part causing some of the errors, but this is also really the only game I’ve had problems with. I’ve also experienced errors (though not as often) when not streaming, so probably a combination of Nvidia and BioWare’s programming are to blame. 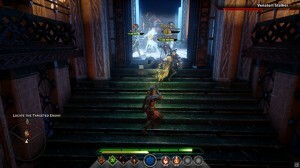 Credit should be given to BioWare’s autosave function, so even if the game did crash on me I would lost about 10 to 20 minutes worth of game time tops, instead of hours. 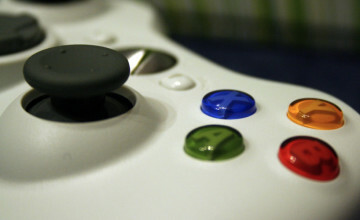 Would I recommend Dragon Age: Inquisition? Yes. 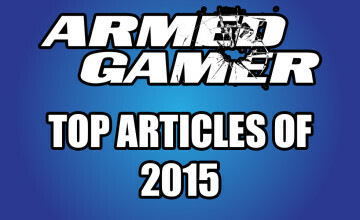 It is one of the most solid RPGs I have played in a while, and an experience I look forward to playing more of. It has bugs, it has problems, and occasionally it is mind-bogglingly frustrating, but I really have to disagree with Zach when he called it a bad game in a previous article. It’s a damn good game, just not perfect. I know there will be more Dragon Age in the future, and I look forward to that as well. Bugs and all, I’m even willing to call this the best entry into the Dragon Age franchise.